Like many gardeners, I try to plant a variety of pollinator-friendly flowering plants in my yard. 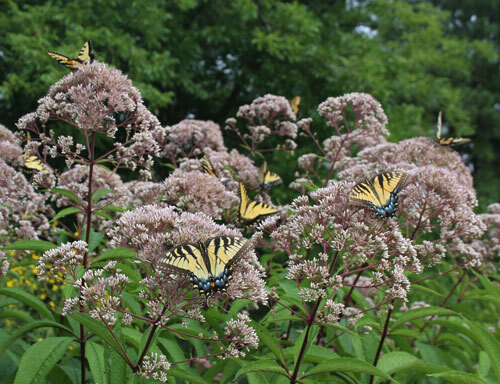 Swallowtail butterflies are frequent visitors and are favorites of my family. 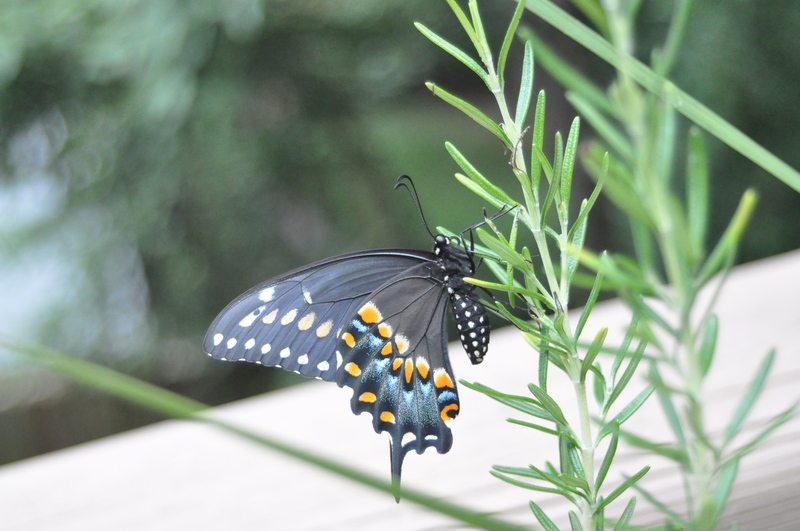 While watching them, we noticed that there seemed to be many differences in the colors and patterns on the swallowtails in our garden, so we decided to do a little research. We found that the butterflies in the garden belonged to two species, and that we could use the patterns on their wings to not only identify the species, but to tell the males from the females. It’s not as tricky as you might think! The Eastern Tiger Swallowtail (Papilio glaucus), is the state butterfly of North Carolina. It can be found throughout the state, and most people recognize its yellow and black tiger striped color pattern. Tiger Swallowtail caterpillars feed in trees. Tulip poplar, sweet bay magnolia, and wild black cherry are favorite host plants. Early instars of the caterpillars look similar to bird droppings. Because eggs, caterpillars, and chrysalis of Eastern Tiger Swallowtails are located in trees, we may not often see these stages of the life cycle. There can be three generations of these butterflies in a year, and they can overwinter in the chrysalis stage. If one species of butterfly with three color patterns wasn’t confusing enough, the black form of the Eastern Tiger Swallowtail resembles another species of swallowtail: the Black Swallowtail (Papilio polyxenes), also known as the Eastern Black Swallowtail. Patterned with blue, orange, and yellow, male and female Black Swallowtails’ wings look similar from the underside. 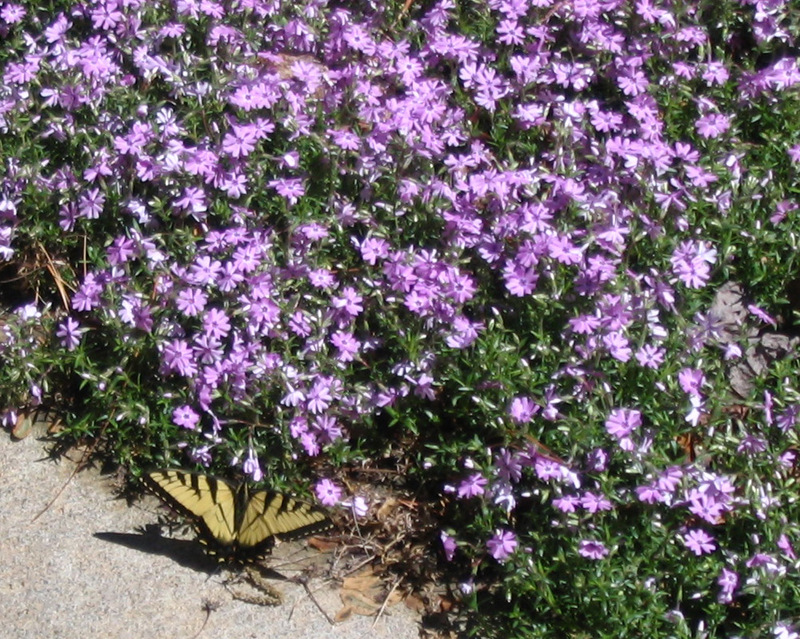 On the top side of the wings, female Black Swallowtails have larger blue spots than males, while males have more prominent yellow spots than the female shown in this photo. 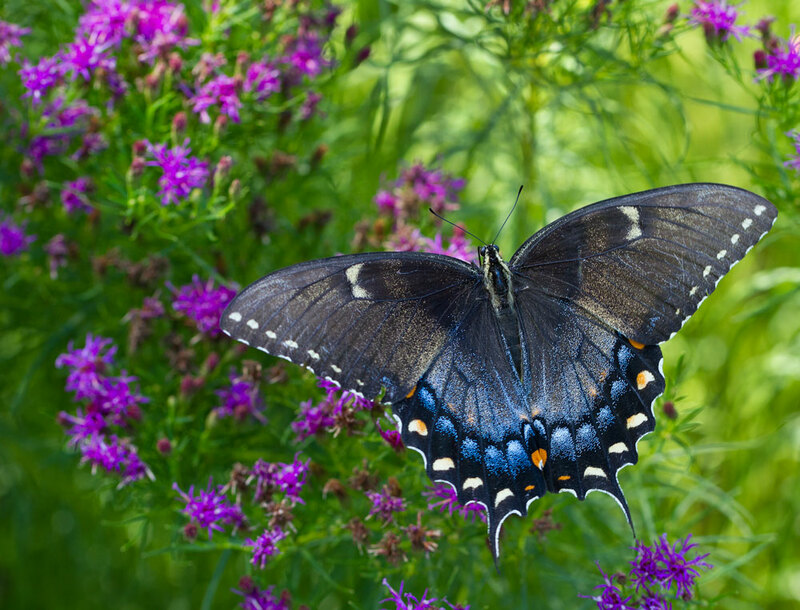 All Black Swallowtails have an orange spot with a smaller black dot inside of it located on the lower wing, which helps to distinguish this butterfly from the black form of the Eastern Tiger Swallowtail or other members of the swallowtail family. Caterpillars are green, yellow, and black. They feed on strong smelling plants, particularly those in the carrot family like dill, fennel, and Queen Anne’s Lace. 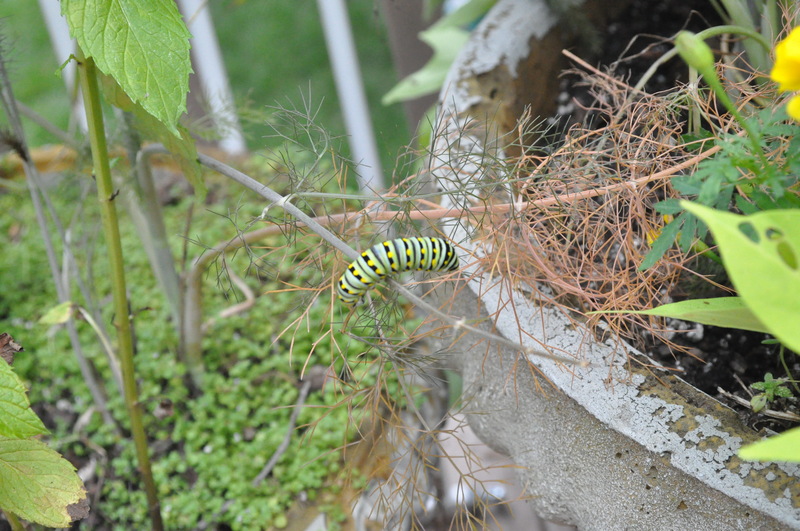 This plant choice helps to protect them, because chemicals in the plants make the caterpillars less tasty to predators. There can be three generations of these swallowtails in a year. Photos: Ann Barnes unless otherwise credited. For more photos of Eastern Tiger Swallowtails, click here. 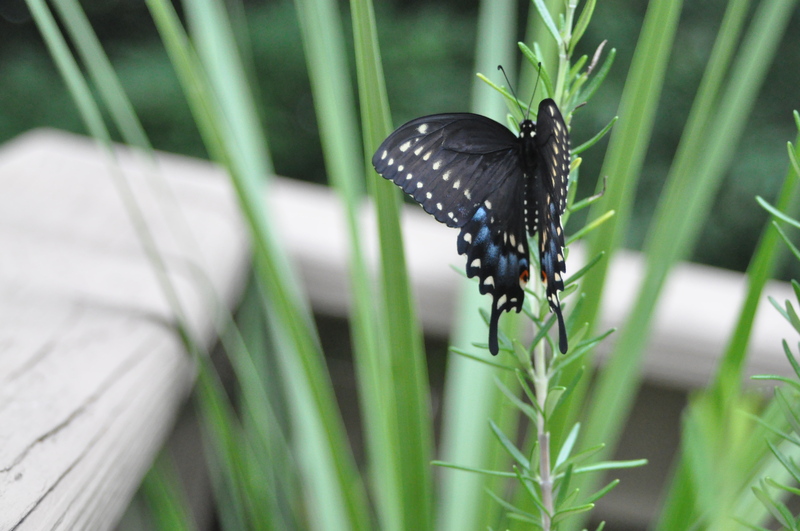 For more photos of Black Swallowtails, click here.